The multi-purpose fire extinguishing simulator can be used for practising fire extinguishing in large spaced industrial buildings, parking garages and shopping centres, and tunnel-like spaces as well as for practicing command of rescue operations, structural fire safety and fire investigation. The multi-purpose fire extinguishing simulator facilitates research and development activities that require modelling in large indoor spaces. This can be e.g. a project in which a large space is used for studying the fire phenomena in shopping centres and the suitable extinguishing methods for these. In addition to using the multi-purpose extinguishing simulator for research and development work, it can be utilised in the investigation of accidents. Rescue operations in a fire when the sprinkler system has been activated. 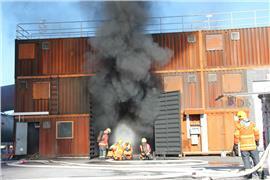 The multi-purpose fire extinguishing simulator is a steel structured container training exercise field. Its external dimensions are approximately as follows: length 30 m, width 24 m, height 9 m.
The multi-purpose fire extinguishing simulator contains a heat protected wide space i.e. the so-called hot side, where students can train with live flames and heat as well as with smoke machine-produced smoke. Also, inside the containers that act as the structure, different types of rescue assignments can be trained. The highest permitted temperature in the heat protected space is 600 degrees Celsius, but during normal exercises the temperature is usually approximately 200 to 300 degrees. Fire and heat are produced on the hot side with a pressurised industrial petrol system and clean wood. The multi-purpose fire extinguishing simulator’s cold space is utilised in different types of rescue operation exercises as well as at vehicle extrication and traffic accident training. In addition to the industrial spaces, the simulator’s conveyor and maintenance tunnels, container frames, roof cavity spaces and air conditioning machine room are used. Numerous smoke machines have been placed in the simulator, which can be used to simulate fires.